Data is from the January 2016 Contact Solutions report titled "Digital Disconnect: How New Consumer Behaviors Disrupt Customer Engagement." 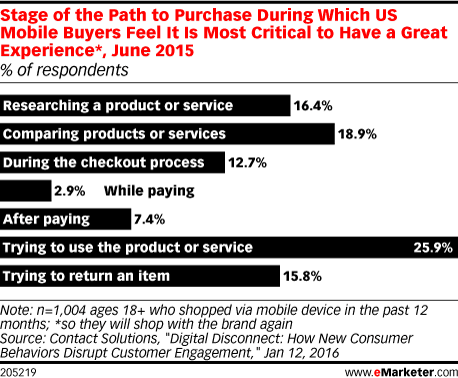 1,004 US mobile buyers ages 18+ who shopped via mobile device in the past 12 months were surveyed during June 2015. 14.9% of respondents owned an Android phone/tablet, 29.3% owned an iOS phone/tablet, 10.9% owned a Mac desktop/laptop and 43.7% owned a Windows desktop/laptop.